Nestled in the side of Watchung Mountains near Basking Ridge, Phareloch Castle was built in the 1920’s as a replica of a 17th century French Normandy Castle. 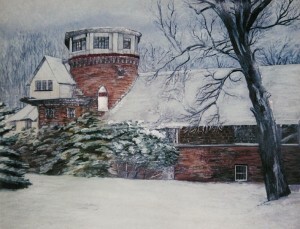 Originally the castle was built to serve as a retreat for artists by Bill and Frank Beatty. It gained national attention when the castle was featured on Unsolved Mysteries. The castle has extensive documentation of hauntings. The main ghost being that of Bill Beatty himself who unfortunately died before his beloved castle was completed. Shortly after his death, Beatty’s apparition started appearing in the castle. The castle is now a PRIVATE Residence, and is currently undergoing extensive renovations to restore it to its former glory.